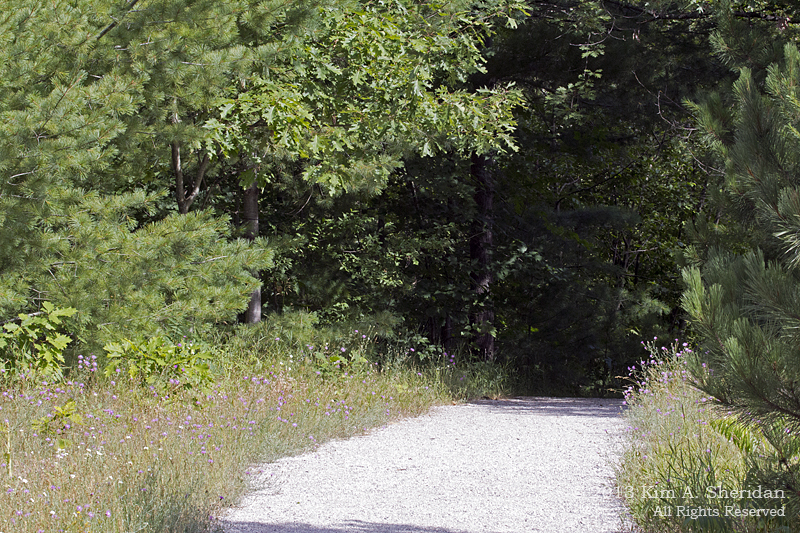 Michigan has 101 State Parks. So far, I had only seen one of them. Obviously, that had to be fixed! It was also time to get away from the Lake Michigan dune area, much as I love it, so I headed inland. 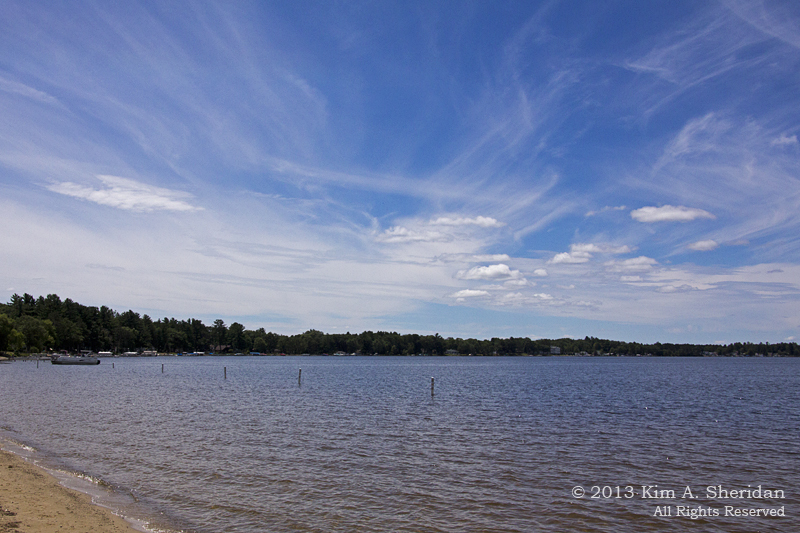 The town of Cadillac is home to Lake Cadillac, Lake Mitchell, and in between, Mitchell State Park. 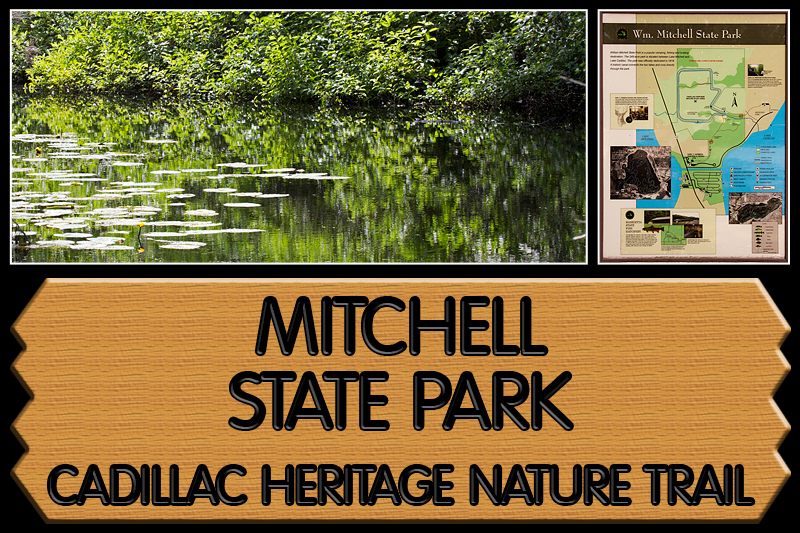 Within the park is the Mitchell Heritage Nature Trail. 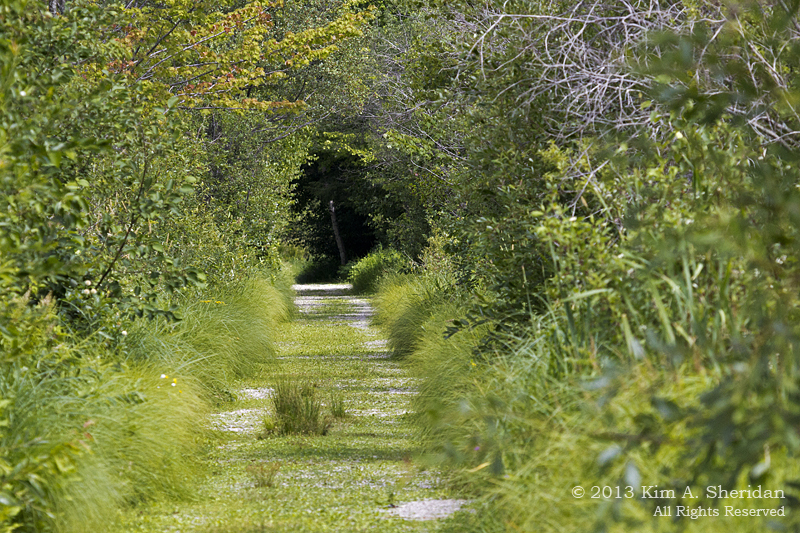 It’s a 2½ mile trail encircling a marsh, and just the thing to keep me out of trouble for a couple of hours. Or eaten alive, which was certainly my fear starting out. 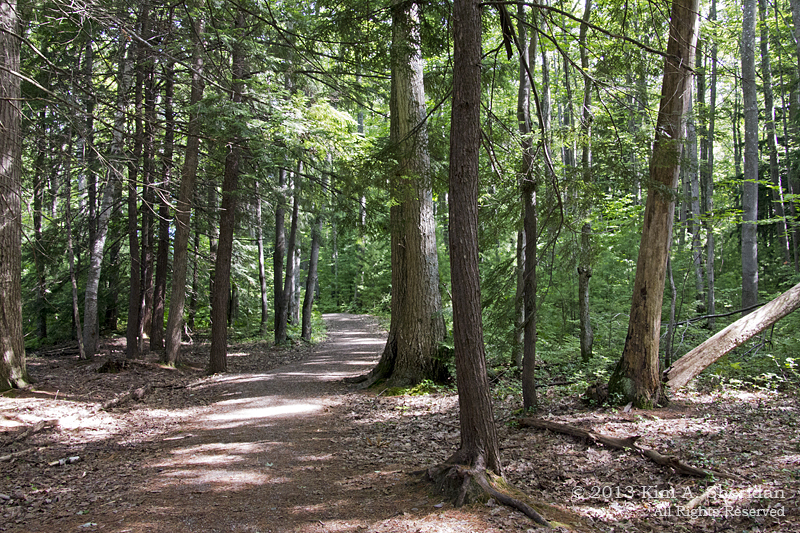 The trail began as a lovely walk through an old growth forest of maple, oak and pine. Turned out it was also home to gangs of marauding vampires in mosquito disguise. Knowing that I was headed for a marsh, I thought it could only get worse. Luckily, I was wrong; apparently these were strictly arboreal skeeters. A brief meadow interlude, followed by a plunge into more woods just beyond. 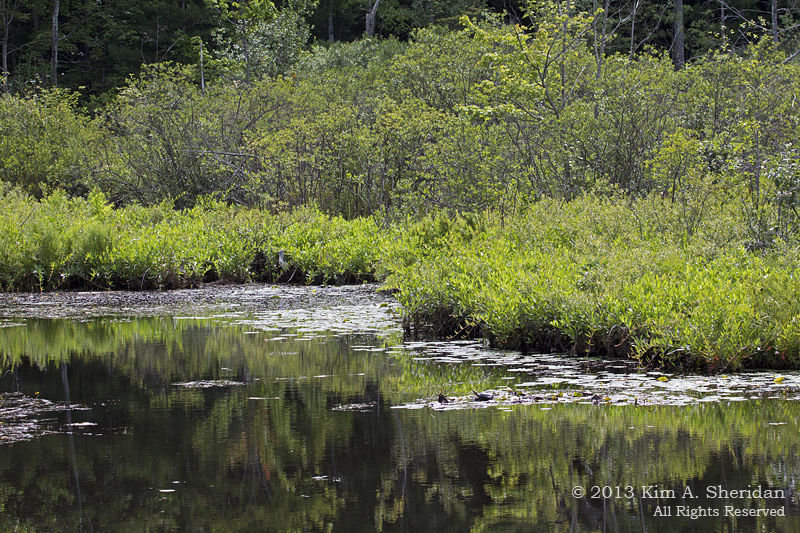 The observation deck offered a wide view of the marsh. From a distance it looks like a confusing tangle of green, doesn’t it? 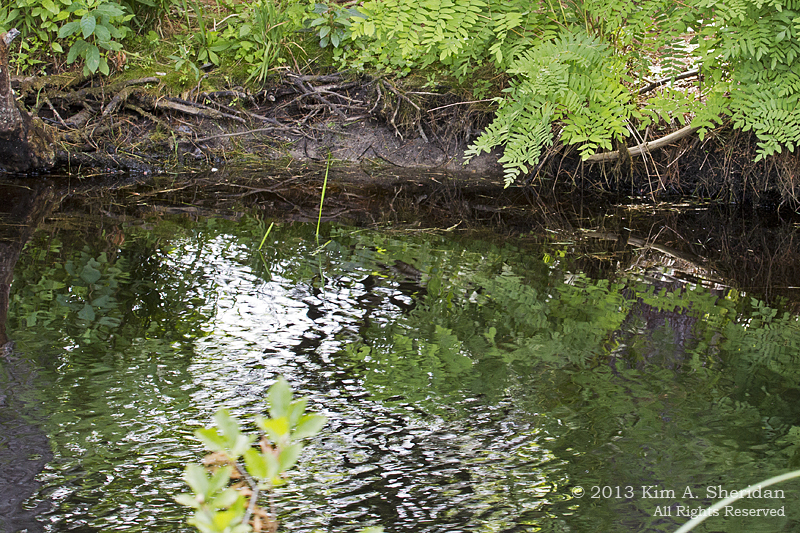 Look closely and you may see that there are dozens of different plants and shrubs here. Great habitat for wildlife. The Goldfinches sure loved it! Outside the trail was a canal that reminded me of a castle moat. This was home to lots of turtles. Ferns reflected in the dark waters of the canal. Birch trees. But of course. FUN FACT: This is a secondary growth forest. The original forest of white pine was decimated by logging in the late 1800s, and fire after that. 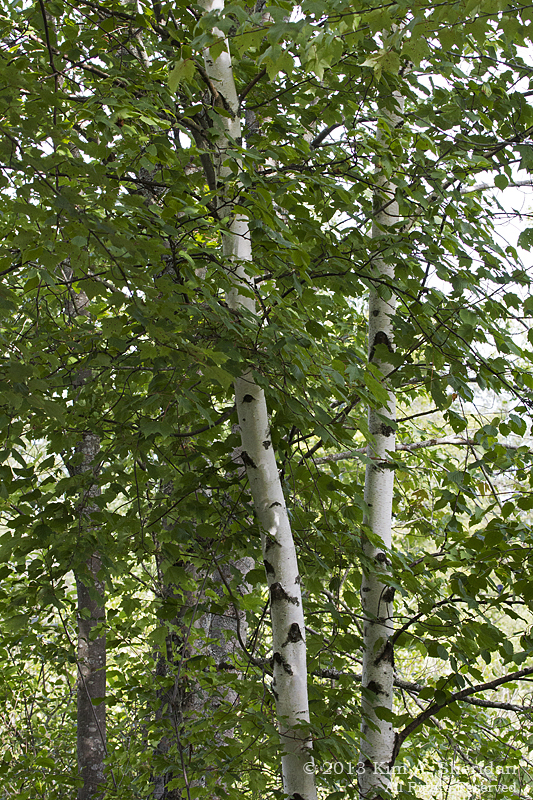 White birch is often called the “fire tree”, because fire exposes minerals that spur the growth of birches, and it’s one of the first trees to reforest a burned area. 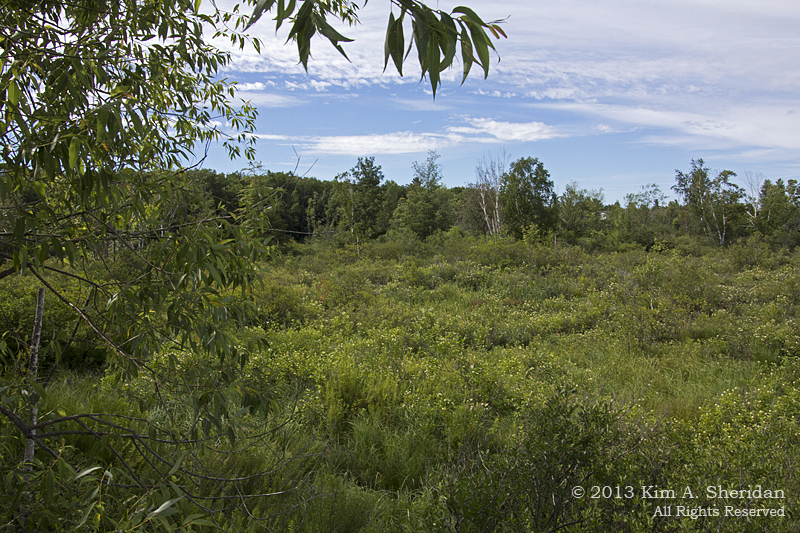 This is an older birch woodland that is already transitioning to a beech and maple forest. 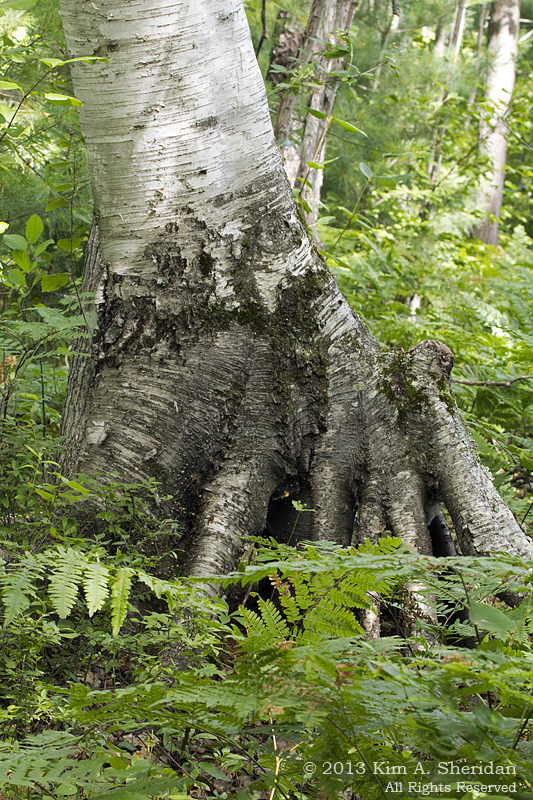 Young birch saplings often drew nourishment from the old pine stumps and grew up around them. Eventually the stumps would rot away underneath. These weird roots are the result! Back from the trail, at the more recreation oriented part of the park, here is Lake Mitchell (above), and the Clam Lake Canal (below.) 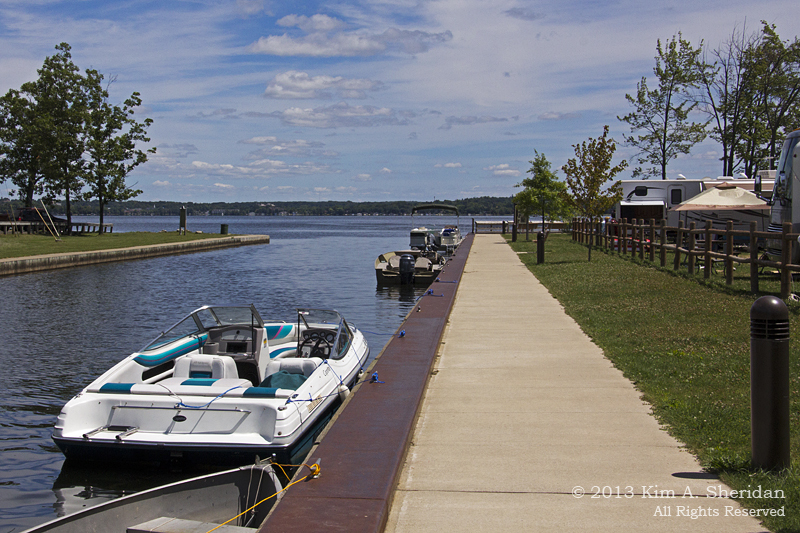 The canal was built in 1873 to float logs between the lakes for the lumber industry, and is a third of a mile long. 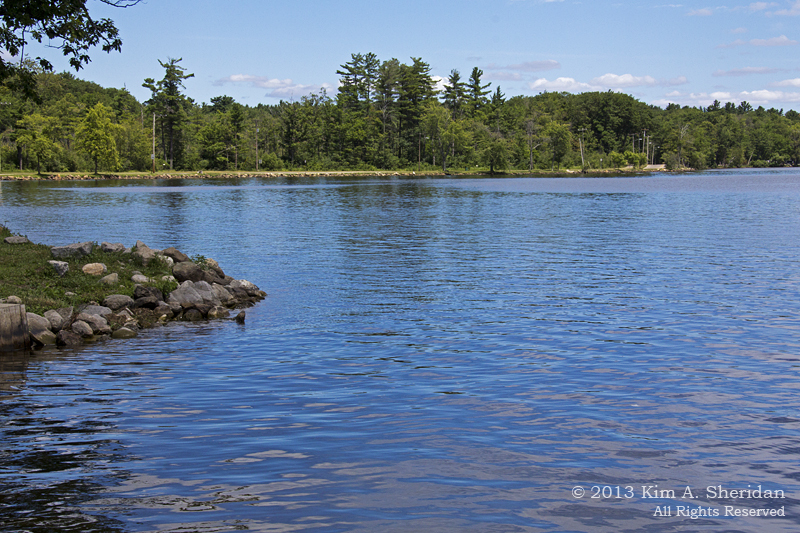 At the end of the canal, Lake Cadillac. 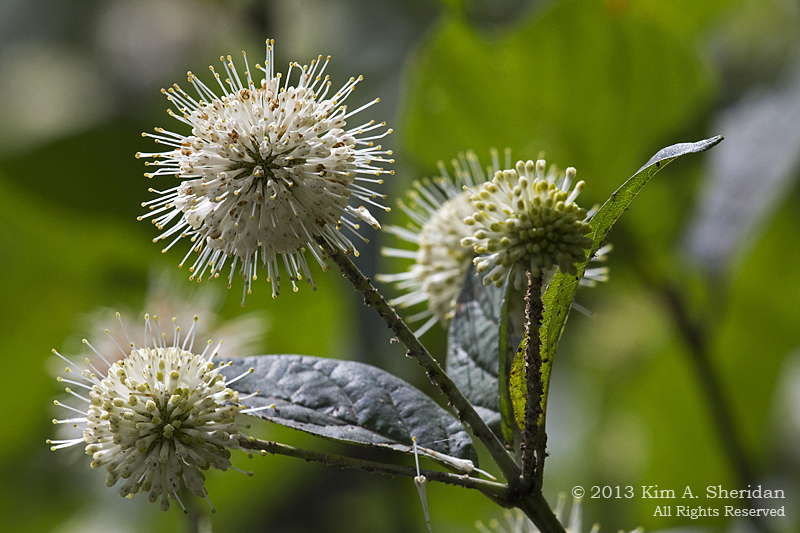 This entry was posted in Michigan, Nature and tagged Flowers Trees & Shrubs, Marsh, Michigan, Mitchell State Park, Nature by Kim. Bookmark the permalink.